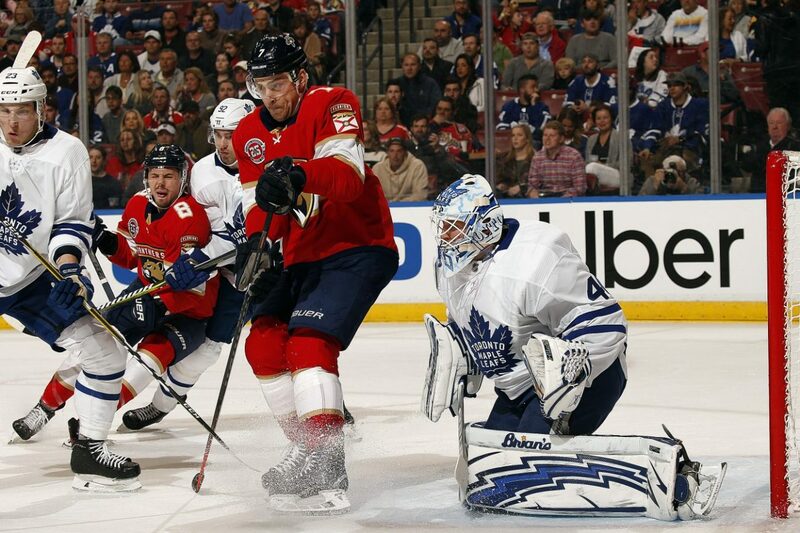 Leafs Goalies Can't Stop What They Can't See And It's a Big Problem Right Now. - The Point Data-driven hockey storytelling that gets right to the point. The Toronto Maple Leafs won 20 of their first 28 games. They have won just 9 of their last 20. Head coach Mike Babcock and General Manager Kyle Dubas have both downplayed the slide. The former talking often about how much his team has had the puck, the latter about how a little adversity may not be the worst thing in the world. William Nylander’s lack of points, Auston Matthews lack of goals and a struggling powerplay have all contributed to the 20-game slump but something rather specific stood out to me when I studied the difference between the Leafs first 28 games and their last 20. It has to do with goaltending and to be perfectly honest, I’m not entirely sure what to make of it but I can tell you it’s been a big problem for the Maple Leafs lately. Recent injuries to Frederik Andersen and then Garret Sparks obviously had a negative impact on the team. During the Leafs first 28 games, of which Andersen started 23, Toronto had the best save percentage in the NHL at .923. In the last 20 games, the Leafs have posted an .894 save percentage, good for 23rd. My first instinct was to see if the defense in front of Andersen, Sparks and Michael Hutchinson was allowing more quality shots against. Nope. The Leafs are actually allowing one and a half fewer high-danger shots against during the 9-9-2 run. What they are allowing a lot more of is screened goals against. This is a tough one to pin on the defenders as the Leafs are allowing 6.4 shots per game with traffic in front of their goalie, 4th lowest in the league over the past 20 games but way more of these shots are going in than the first 28 games. 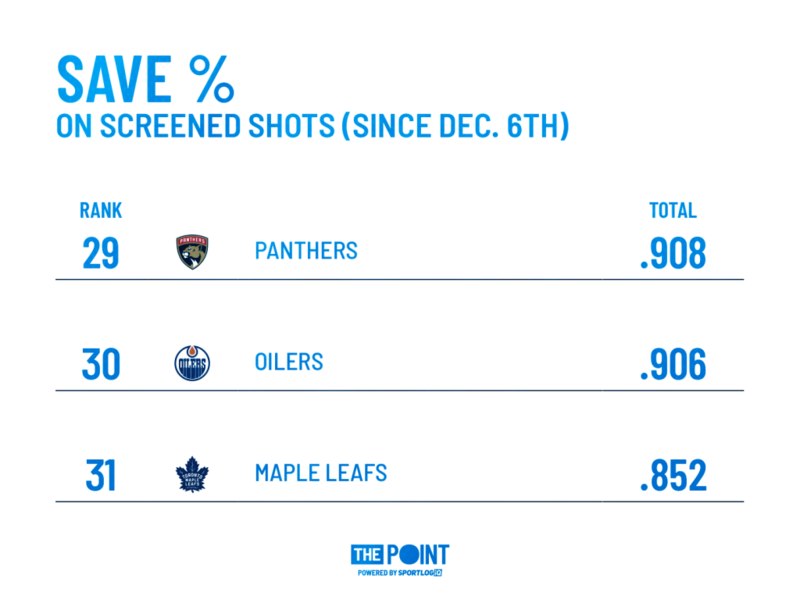 Maple Leafs goaltenders were stopping almost 98 percent of shots with traffic in front of them during the first 28 games of the season, when they had the best overall save percentage in the league. That number has dropped over 100 points to a league worst .852 in the last 20 games, by far the worst save percentage in the league. All told, the Maple Leafs are allowing almost a goal per game off screened shots. Whether it’s Andersen, Sparks or Hutchinson – they are stopping an incredibly low percentage of these shots lately. When you look at many of the goals against, you’ll see a combination of these goalies looking the wrong way around traffic, defenders being left unchecked at the top of the paint and a handful of blind guesses. A trained goalie coach would have a better idea of whether or not this is a communication issue with defenders. After talking to a couple ex-goalies, both said that most teams have an understanding as to whether the defender will take away the strong or weak side on an incoming shot. Braden Holtby talked about this during the Stanley Cup Final last season, saying, “Guys go out there strategically to know which lane I’m picking for a sightline and they’re taking away the other half and making big blocks. That’s a huge part of why we’re having success defensively.” One half for the goalie to worry about, one half for the defender. 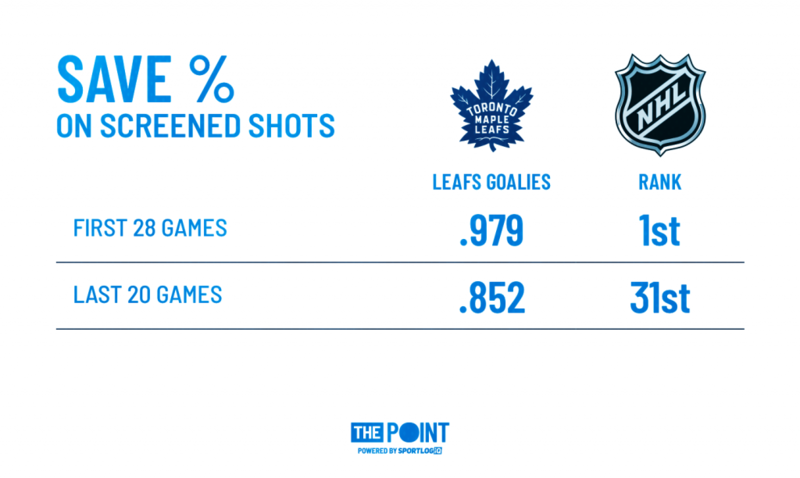 The problem here for the Maple Leafs is that they don’t block a lot of shots. Understanding that often times teams that block a lot of shots are teams that are often defending, I look at shot blocking as a percentage to get a better gauge of which teams make a concerted effort to do it. 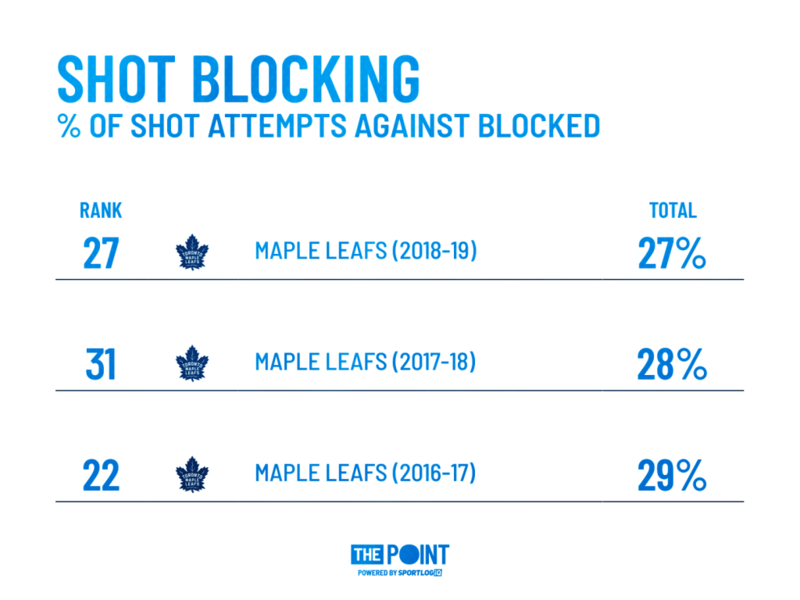 Under Mike Babcock, the Maple Leafs have not been a shot blocking team. Andersen has started half of the Maple Leafs 10 games during this 20-game slide while Sparks and Hutchinson have split the other 10. None of the three have done a particularity good job of keeping pucks out of the net and these screened shots are giving them fits right now. Either Maple Leafs goalies are going to have to work around the issue of seeing around opposing players or the defenders are going to have to do a better job of getting in shooting lanes if the team wants to limit its goals against, improve its save percentage and get back to winning more often than they lose.